The bird on the reverse side of the coin is an American eagle with outstretched wings. In one talon it holds an olive branch, in the other talon it holds arrows, symbolizing that the United States is a peaceful nation but will defend itself if necessary. George T. Morgan’s initial “M” appears on both sides of the coin. On the reverse the tiny “M” is on the left hand side of the ribbon at the center of the laurel wreath. 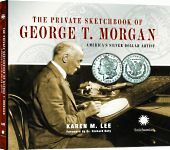 The mint mark (if there is one) appears at the center bottom, between the laurel wreath and the words “ONE DOLLAR.” The Morgan dollar was minted at five different branches of the U.S. Mint. If the coin is marked “CC” it was minted in Carson City, Nevada. If the coin is marked “O” it was minted in New Orleans, Louisiana. If the coin is marked “S” it was minted in San Francisco. If the coin is marked “D” it was minted in Denver, Colorado. 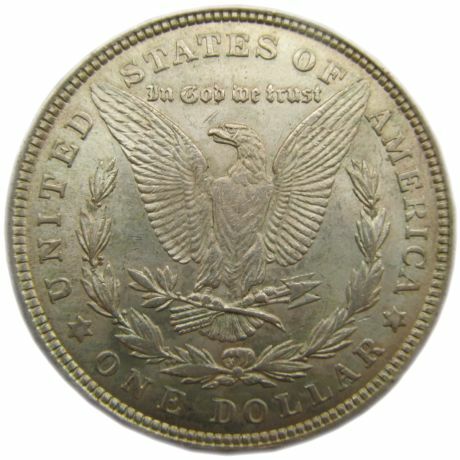 If there is no mint mark, the coin was minted in Philadelphia. Filed under Coins Reverse, Morgan Silver Dollar.